Superintendent Dean is a 25+ year veteran educator in Michigan Schools. She earned her BA in Elementary Education in 1988 from Michigan State University and her Masters Degree in Educational Leadership from Grand Valley State University in 2001. Her teaching career began at St. Francis Xavier School as a Middle School teacher in 1989. She moved to Onaway Area schools in 1994 as an Elementary teacher and Title I Coordinator. In 2009 she was employed by the Pellston Board of Education as Elementary Principal. At a regular meeting of the Board held on Monday, May 13, 2013, a decision to promote Mrs. Monique Dean to the superintendent vacancy was unanimously approved (one member absent). Mrs. Dean was given a three year contract, July 1, 2013 through June 30, 2016. The decision to employ Monique was made following an interview held at a special meeting held on April 22, 2013. According to Board president, Kathy Smith, “Monique has well prepared herself for this important leadership position” “ She is an exemplary principal and has demonstrated over and over again outstanding leadership skills that will benefit the school district and it students, staff and parents” she added. In her letter to the Board of Education, Monique stated, “The provision of excellent and meaningful education to our children relies upon the delivery of a school experience that is professional and appropriate for each child and that is guided by research-based programs and data driven decision making”. It is her goal to guide this district through the many changes being legislated to districts and to help all students achieve at their highest potential. “The task is enormous, but I am up to it and very excited about the opportunity” . Mr. Bacon is originally from the East Jordan area. Enos attended Alma College and Cooley Law School prior to moving his family to Arizona to assume teaching and administrative duties in Lake Havasu. 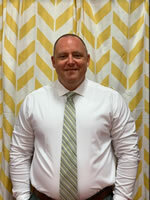 During his six years in the district he served as a Middle School teacher, coach, Dean of Students and Asst. Principal.